The rapid increase in popularity of Prosecco was one of the reasons behind the extension of the legally permitted production area. Now those areas have been re-designated as DOCG and cover the Asolo / Colli Asolani and Conegliano / Valdobbiadene areas. The remaining, wider DOC area covers Treviso in the Veneto and Trieste in Friuli. With the dramatic growth in demand comes a divergence of opinion and belief amongst the producers, in terms of their core values. Whilst all are delighted with the rise to international fame of Prosecco, some fear the potentially negative effects, in terms of a devaluation of their brand, with concerns that Prosecco may become the ‘modern day Lambrusco’. Many of the smaller producers in the DOCG have not increased their production dramatically, but are rather concentrating on diversifying and developing a broader portfolio and different styles within the legal denomination. It’s the larger producers, and the new farmers who own land in the larger, broader DOC area, who may be less focussed on the quality of the grape or production, in order to leap on the fashion bandwagon, and this is where the danger lies in terms of retaining the quality of production. DOC means ‘Denominazione di origine controllata’ a term, which defines a specified area of production with strict laws regarding the region, permitted grape varieties, maximum level of grape yields, wine styles and alcohol levels. There are about 330 DOCs in Italy. In the case of Prosecco, this means that all the wine must be produced in the aforementioned Frizzante or Spumante style, from the approved grape varieties within the boundaries of the Treviso and Trieste areas. 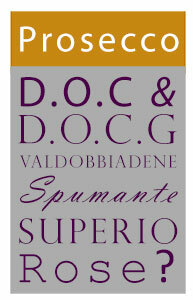 DOCG is the highest quality designation in Italian wine law, meaning ‘Denominazione di origine controllata e garantita’. DOCGs are awarded to the top quality producing regions in Italy, and as well as similar laws to DOC regarding yields, grapes and demarcations, there are laws on winemaking procedures, production styles and ageing. Yields are lower than for DOC, focussing on quality grape production. In Prosecco, the original delimited regions, prior to the Prosecco boom, have now been promoted to DOCG status – this includes Conegliano and Valdobbiadene and Asolo / Colli Asolani in the Veneto area. Prosecco di Conegliano or Prosecco di Valdobbiadene is an appellation, which was DOC and established in 1969 to protect the region, but has been elevated to DOCG status since 2009. It covers 13 towns in the region and covers an area of about 25km, running east to west, just north of Colli Asolani, and nestled in the foothills of the Alps. This is where some of the very best Prosecco comes from, with restricted yields, and grapes grown on optimum sites up in the hills. There is a further sub- delineation within Conegliano- Valdobbiadene – if the wines are produced within the small sub area of San Pietro di Barbossa, which lies to the east of Valdobbiadene, they can add the words ‘Superiore di Cartizze’ to the label, which takes the quality up a further notch. Cartizze is an 1000ft high vineyard, covering about 100hectares, which is viewed as the ‘premier cru’ of Prosecco. Colli Asolani is another top quality area, which was given the DOCG in 2009, when all the other regulations were changing. It is a small area, covering around 8km in width, nestled in the hilly region south of Valdobbiadene, on slopes facing south towards Venice, which lies about 50km south. Rose – currently, there is no specific Prosecco DOC for rose wines made in the Prosecco region. However, the majority of the export brands and producers are now making sparkling pink wine, which has to be marketed simply as ‘Vino Spumante’ or ‘Vino Frizzante’; or if it is produced from a single grape variety, usually Pinot nero, it is labelled ‘Pinot Nero Spumante’.